‘Smile Makeovers’ in Only Two Visits! If you have badly shaped teeth, wide gaps, or odd staining, our porcelain veneers may make it possible for you to obtain an amazing smile. Veneers are made from very thin, durable sheets of the most advanced dental ceramic available. They are affixed to your natural teeth in a way that makes them seem straight and uniform, as if they’ve had years of orthodontic work. Dr. Park can use also use veneers to conceal chipped, cracked, or worn teeth. 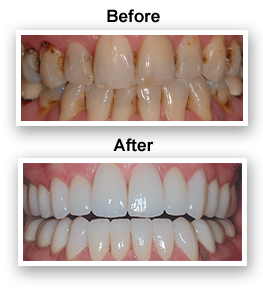 And because the veneer is made to match the color of your surrounding teeth, they look totally natural.